1. Nothing Martin McGuinness may do will ever be enough for unionist politicians. If he were to walk naked through the streets of Windsor, wearing only a placard saying “I am a mindless terrorist - please forgive my misguided campaign and lock me up for life”, there would be those like Nigel Dodds, Arlene Foster and Mike Nesbitt who would say “While it’s good that Mr McGuinness has now accepted his own evil, it’s a pity he didn’t acknowledge it forty years ago”. So this morning it’s “Never mind Windsor Castle, what about these guns that were being smuggled from America?” The terms ‘dead horse’ and ‘flogging’ come to mind. 2. President Michael D Higgins either doesn’t believe or is not prepared publicly to acknowledge that Ireland consists of thirty-two counties. Elegant and eloquent though his speech was, it danced around the fact that Ireland is partitioned. Northern Ireland was seen as a place apart, a patient that must be tended by Dr Britain and Dr Ireland (i.e., the twenty-six counties). The real Ireland was the southern state. 3. The most significant of the dozens of tweets I saw during the Windsor banquet last night was that by someone who asked “Have I just turned on the sixteenth century?” To say that the setting was palatial, the needs of guests catered to by an army of eager flunkies, would be to understate things. The movement of the two heads of state to the sound of the British national anthem, the white tie and tails, the massive jewels (they were real jewels, weren’t they?) 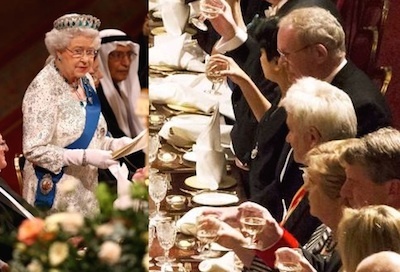 draped around Queen Elizabeth’s throat - no expense was spared. This at a time of economic depression, and paid for out of the pockets of people in this northern part of Ireland as well as in Britain. Are tax-payers mad? Can they not see the embarrassing luxury of their leaders and contrast that with their own thread-bare existence? It appears not. I didn’t see any other tweets suggesting they might have cut back a bit. 4. The idea that the English people will now see Irish people as intelligent workers, contributing to the British society they live in, is a delusion. Michael D Higgins made much of the contribution Irish people made and are making to British life. Yesterday afternoon on BBC Radio 2, Paddy Kielty told a traffic-report woman that there are “just two things the Irish do well: drinking and gossip”. That’s nearer the benevolent view the British have of us. Grand talkers and sure don’t we love a drop of the hard stuff, ye-hoooo! 5. Last night showed that relations between Britain and Ireland have now entered the realm of the surreal. Even those with the faintest grasp of history will know that the quarrel between Britain and Ireland centres on Britain’s claim to exercise jurisdiction over Ireland. And anyone with the faintest awareness of current politics/geography will know that the exercise of British jurisdiction in the six northern Irish counties remains the single biggest bone of contention between the two countries. Yet not once, by anyone, was the problem acknowledged. Of course it’s complicated, of course it requires diplomacy and sensitivity. But to pretend that smelly bear seated on your hearth is either a gorgeous hearth-rug or doesn’t exist: that’s just a wee bit mad.